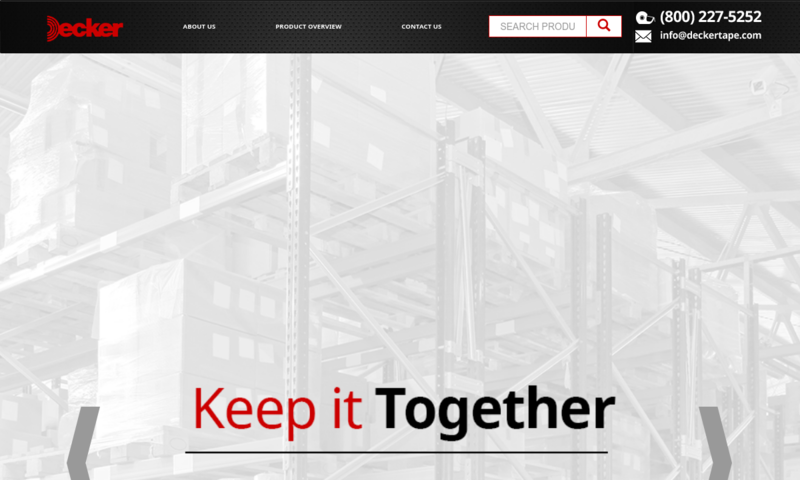 A reliable source for Tape Suppliers information and a resource for accessing leading Tape Suppliers and suppliers. Tape, made of long strips of adhesive materials, is primarily used for a wide range of bonding and fastening applications, though it has several other applications as well. Typical tape applications include: fastening, sealing, bonding and binding. More specifically, tape products are used for: mending, protecting, jacketing, labeling, decorating, surfacing, surface marking and color coding. Tape Tape, made of long strips of adhesive materials, is primarily used for a wide range of bonding and fastening applications, though it has several other applications as well. 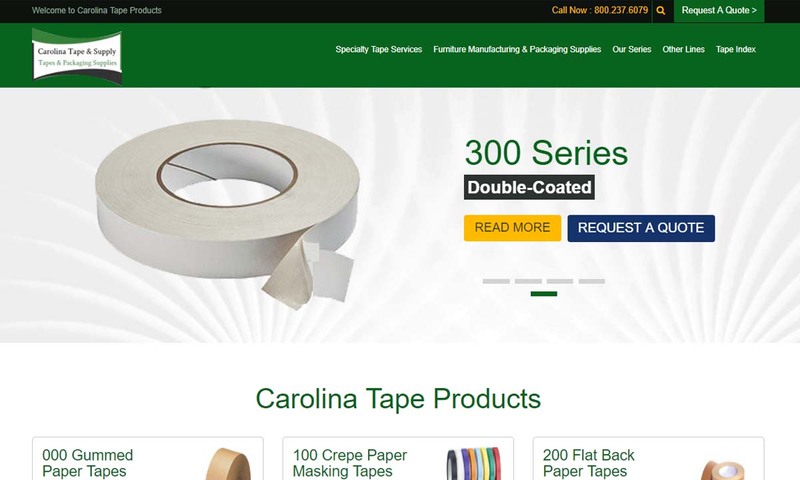 Carolina Tape & Supply Co. is a distributor & custom tapes converter offering 100% satisfaction. 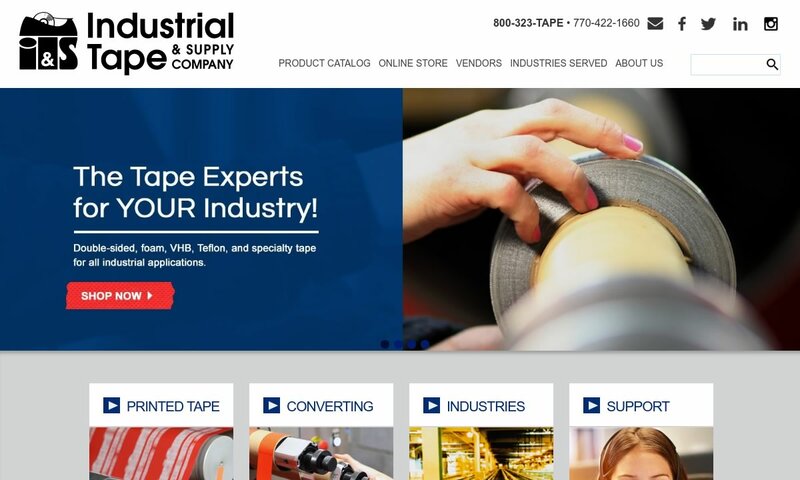 As one of the leading tape suppliers in the nation, Carolina offers an array of quality products & services to your company. 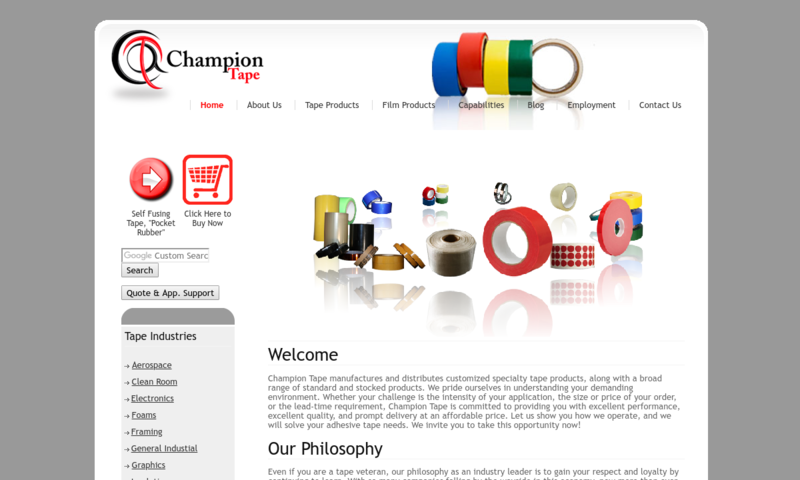 Champion Tape manufactures and distributes customized specialty tape and masking products, along with a broad range of standard and stocked products. 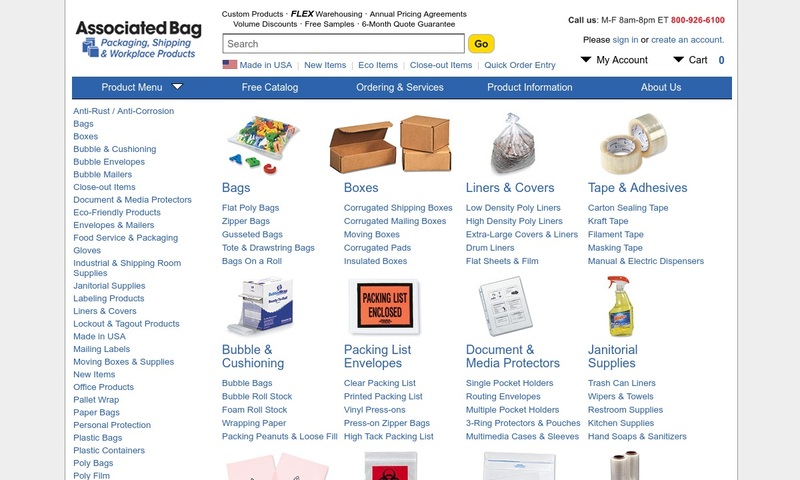 Associated Bag is a family-owned business that has been providing a wide range of tape products for over 75 years. Our line of tape products include 3M tape, foam tape, masking tape, and more. Among tape suppliers, we are the best in the industry. We offer generous account terms, quality guarantees, and no-hassle policies that satisfied the needs of all customers. 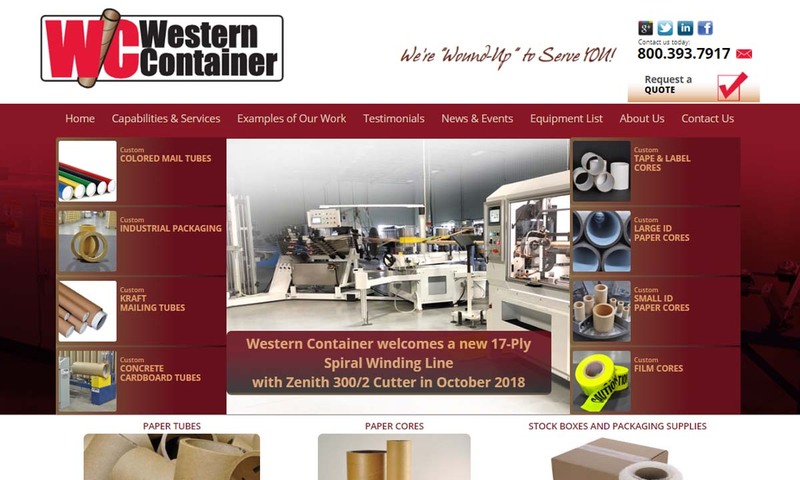 Being a leading manufacturer of packaging and mailing containers, Western Container offers customers packaging and solutions for the tape industry. Since 1954, Industrial Tape has satisfied many tape & packaging needs for our customers. We distribute, print and convert over 500 types of pressure sensitive tapes. Adhesive tape is the descendant of the glue-like bonding adhesive used thousands of years ago. Back in 70,000 BC, cavemen in South Africa sealed their cave paintings with a proto-glue made from a mixture of red ochre and tree sap. Much later, in 2000 BC, the Egyptians were the first (of whom we know) to write down instructions for making glue. Between 618 BC and 906 BC, the Chinese glued surfaces and bonded materials using animal glue. This glue was made from materials such as stag horn and fish bladder. The practice of making animal glue, unfortunately, continued for countless years. Most notably, in the 1700s, people were bonding things using horse glue. Today, we are happy to note, most glue is made from synthetic chemicals. A surgeon named Dr. Horace brought adhesive glue and carrier material together for the first time in 1845. He made the first adhesive tape when, in order to make bandages that bonded better, he applied a rubber-based adhesive to fabric strips. He called his invention surgical tape. His surgical tape was the best adhesive tape around for about 50 years. This changed in 1901, when a German man named Oscar Troplowitz invented an adhesive patch, which he called Leukoplast. It was manufactured and distributed by a company called Beiersdorf AG. Then, in 1921, after Dr. Day’s surgical tape kept falling off his wife’s fingers, an American man named Earle Dickson invented a bonding tape that came to be known as the Band-Aid. This was designed to stay on skin surfaces. He did so by glue bonding gauze to cloth-backed tape, then covering it in crinoline. He brought his bandage to Johnson & Johnson, who promptly made him a VP and named his invention the Band-Aid. A few years later, in 1925, an employee of 3M, which at that time sold sandpaper products, invented masking tape. His name was Richard Drew. His goal was to create a bond adhesive to help automotive manufacturers paint straight lines on the surface of two-tone cars, which were quite popular at that time. They later named this tape Scotch Tape. Today, they’re one of the most prominent tape manufacturing companies in the world. A little under 20 years later, in 1942, Johnson & Johnson came out with duct tape. They developed this bond tape to help soldiers on the field repair and seal or waterproof their ammo cases. Tape used today is more diverse and has more useful applications than ever. In addition, with the advancement of material extraction and fabrication, manufacturers have come out with some specialty tapes, like double-sided tape. They also continue to develop stronger and thinner tapes for heavier surfaces. Tape is very simple. It features a carrier material and a bond adhesive. To make their products, tape suppliers engage is a fairly simple process called coating, wherein adhesive glue is applied to a carrier material. There are three main methods of coating: water-based coating, solvent coating and hot-melt coating. Water-based coating solutions are made by mixing the bond adhesive with water to form emulsions, or small, suspended globs of one of the liquids in the other. After the solution is made, the glue is simply coated on the surface. Solvent coating involves using a solvent to dissolve the bond adhesive and thereby create a comparably non-viscous liquid. This liquid glue is coated onto the carrier material. After the surface has been coated, suppliers remove the solvent by passing the tape through a heated oven. Hot-melt coating is performed in the way that its name suggests; the bond adhesive is heated until it reaches its melting point, and then it is coated onto the carrier material as a hot liquid glue. After coating, the tape and the glue only need cool to become a finished product. When a sheet of tape is finished, it may still undergo a variety of converting processes before it is ready to be shipped. It may, for example, undergo winding, which is when the sheet is wound and formed into a large roll of tape. Or it may be slit. The slitting process is completed by taking a large roll of coated tape and cutting it into smaller strips that can be sold. Tape may also be die cut instead of slit. Steps like these prepare tape surfaces to be the types we recognize at the store. The carrier material may be any one of a collection of moderately thin and flexible materials, such as metal foils, paper tissues, cloth or films. Typical tape carrier materials include: PVC, EPDM, PTFE, aluminum foil, copper foil, polylactic acid, cellulose acetate, stretch film and polyimide film. Typical glue adhesives include: epoxy adhesive, silicone adhesive, structural adhesive, electronics adhesive and melt adhesive glue. Tape suppliers make a lot of standard tape. However, for your applications, they can custom manufacture their products. To do so, they think about application details like: required adhesion strength, surface material (acid-sensitive surface, weak paint surface, sterile surface, etc. ), amount of tape required, required markings, etc. They custom design details like: tape thickness, tape color, tape print, tape length (amount of tape on dispenser), dispenser type, glue type and carrier material type. They can also manufacture clear tape. Pressure sensitive adhesives are the most common type of application-specific tapes. These adhesives form a strong bond between tape and the substrate through the employment of pressure. Tapes like these include duct tape, masking tape, packaging tape, electrical tape and others. Duct tape is a soft pressure tape made with adhesive glue of a tacky-like consistency. Strong and versatile, duct tape is used by individual consumers and manufacturers alike. It creates a very strong bond. It is such a powerful industrial tape that it can be used for high-stake applications, like water sealing military equipment. Masking tape is made of an easy-release, easy-tear adhesive, and is most often used around the house for light-duty tasks, like taping a paper to the wall. Packaging tape is a bit stronger, made with packaging and shipping in mind. It is perfect for securing packages, envelopes, bags, etc., so that they will not loosen, tear, break or burst. Electrical tape is called such because it is made to insulate electrical wires and other conduits. It is made from non-conductive, pressure sensitive materials. A second type of tapes are those that are defined by the material used to produce them. Examples include foam tape, foil tape, PTFE tape and vinyl tape. Foam tape is usually made from polyethylene or a similar material. Because of this, it is ductile, resistant to chemicals and heat and has high impact strength. Often, one or both its sides are tacky. Foam tape is best for weather-stripping, insulation, gasketing, sealing, cushioning, soundproofing and baffle. Foil tape is made using a copper foil or aluminum foil carrier material. Because copper and aluminum have strong chemical resistance and high thermal conductivity, foil tape is used for shielding and plating in industries like electronics and aerospace. PTFE tape is used mostly to seal pipe threads. To that end, the PTFE film from which it is made is cut into thin strips. Vinyl tape, also known as PVC adhesive tape, is designed to have superior dead stretch and to come off without leaving residue. Available in a wide variety of colors, it is perfect for things like: safety marking, color coding, identification and decoration. PVC adhesive tape can also be used as PVC insulation tape. Less common pressure sensitive adhesive tapes include: gaffer’s tape, marking tape, sealing tape, 3M tape, various styles of printed tape, acid free tape, double-sided tape, side tape and paper tape. Gaffer’s tape, or gaffer tape, is a pressure sensitive tape made from heavy cotton cloth coated with a strong adhesive. Most often, gaffer tape is used to complete stage and theater tasks like laying blocking markers and securing video cables. Marking tape, also known as mark tape, is used to mark areas designated for different things, like where equipment should go. It is found in a variety of manufacturing workshops and factories. Sealing tape, or seal tape, is used to bond two or more mating surfaces or materials. It is also used to close and/or seal slotted containers like corrugated fiberboard boxes and packing cartons. There are many different types of sealing tape. Some of the most common include: printable carton sealing tape, acrylic carton sealing tape and hot melt carton sealing tape. 3M tape is tape made by the 3M brand. One of the most common 3M tape varieties is Scotch Tape. 3M tape is popular in many different industries. Printed tape is any tape with words or patterns printed on it. Acid free tape is a type of adhesive tape that does not contain any acids. Acid-free tape is safe for use on photos and artwork (it does not leave marks or discoloration) and does not bother people with acid sensitivities. Double-sided tape, also known as double-coated tape or adhesive transfer tape, has sticky adhesive on both sides of its carrier material. Double-sided tape works best with lightweight materials/surfaces, like paper to a wall, plastic to plastic or cardboard. Some double-sided tape is manufactured with a liner on one side, which the user removes when they are ready to use the tape. Side tape, sometimes called edge tape, is a specialty tape designed for sports. People wrap it around equipment like tennis racquets to improve grip. Paper tape is often used with bandaging tape because it is hypoallergenic, breathable and lightweight. Common tape accessories include tools like: scissors, exacto knives, marking tools and applicators, tape dispensers, sprays and the like. Usually, industry leaders want tape that meets ISO and/or ASTM International standards. Certification from ISO means that the tape has high quality characteristics, like: durability, peel resistance, thermal stability, tensile lap-shear strength, clean removal and wood-to-wood adhesive bonding. If your tape is certified by ASTM International, you will know that it has been quality tested and its various properties have been identified. Such properties include: tensile strength, shear strength, fracture, shear modulus, adhesion bonding, creep and viscosity. Tape is pretty easy to come by. However, if you need specialized tape or you have a critical bonding application, we recommend you work with a contract manufacturer. The right adhesive tape manufacturer can make sure that you get tape that matches your specifications, meets your standard requirements and will hold up against the elements.  To find the right manufacturer for you, check out the list of companies we’ve put on this page. For your convenience, we have also included profiles detailing their products and services. Take some time now and browse them. Choose three or four that appear offer services that best match your specifications, then reach out to each of with your questions. Make sure to discuss your standard requirements, budget, timeline and delivery preferences. After you have spoken with each of them, select the one you believe will serve you best, then reach out to them again to get started. Good luck!